Colored film-faced plywood is lightweight and resistant to corrosion attack and detergents. This material is simple to process and can easily be combined with other materials. Colored film-faced plywood is mainly used in high temperature drop conditions, in areas with moisture and is therefore a great material for open conditions. Colored film-faced plywood is made of Northern wood which ensures the durability of the panel whereas damage resistance is ensured by high-quality import film coats on the panel. Highly water-and wear resistant colored film-faced plywood is achieved by painting the edges of the plywood with waterproof paint and film-facing it. All of the above mentioned qualities of colored film-faced plywood make this material excellent to use in many different areas. The film-faced panels water-and-wear resistant surface makes it a good material to use for stadiums, event constructions, children playgrounds. Since colored film-faced plywood is water-and-wear resistant, ecologically safe and resistant to detergents this material finds good use in packing manufacture. 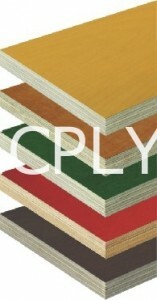 As the name colored film-faced plywood says there are many different colors that this material comes in. Therefore it is highly appreciated also by the furniture industry. This material finds use in furniture manufacturing, interior decoration and so on.